I’ve never actually been in love. With a person at least. I don’t know what it’s like to lock eyes with your soulmate and know that’s the person you’re destined to spend the rest of your life with. But, I know what it’s like to feel that way about a place. University of Georgia is my one “true love.” For a kid for 18 years of his life that never felt accepted or at ease anywhere else, I instantly felt that sense of home and belonging when I stepped foot on campus. And no one can take that from me. And no one should take that from you either. No racist Yik Yak post, disrespectful drink at a bar DT, or any anonymous threat can take away my love for my institution. It doesn’t devalue the satisfaction I get when I watch UGA win in Sanford. It doesn’t make all the loud and side hurting laughs I have with my peers during Tate Time. And it certainly doesn’t make me want to transfer from UGA. I’m proud to be a student at UGA. I’m proud to be a black student at UGA. Most of all, I’m proud to be a black student at UGA that seeks change. I fully believe the administration here at UGA values every black student’s opinion. They have built programs and initiatives that have sought to increase the retention of minority students and give us a platform to express our opinion. I always tell black students if you have the chance to go talk to the administration and faculty. Go speak with Dr. Bill McDonald, Ms. V, Zoe Johnson, and VP Victor Wilson. When I was doing interviews for the BUGA documentary, VP Wilson had a quote that stuck with me. It’s a sad fact that black students have to deal with here at UGA. And every now and then, whether it be subtle or not so subtle, we are reminded. The situation in Mizzou is our wakeup call here. I just think back to two years ago after the Yik Yak posts and the racial slur left on the LGBTQ and Black Affairs Council’s page. How close we were to this Mizzou situation. We marched. Protested. Rallied. And talked. President Morehead released a statement condemning racism on campus and then we all just stopped talking about it. It went away. I applaud the students of Mizzou for not letting it go away. 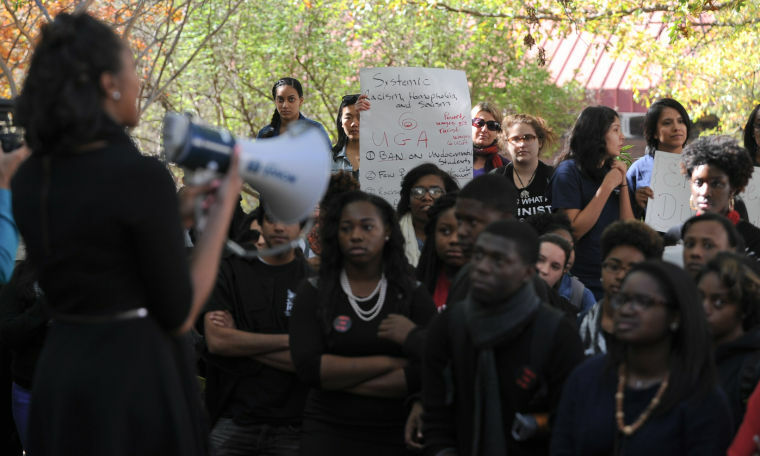 They challenged and combated the racism they saw on campus. They would not let their voice be silenced. It was beautiful to watch. It was inspiring to watch. It was also hard to watch. After seeing the students cry after the protest, my heart just sunk. To fight that hard, to yell that loud to get your voice heard, to put your feelings on your sleeve, just to be met with more racism and threats against your life is unexplainable. The most annoying aspect of the whole Mizzou situation where those who asked why didn’t the students just transfer if they were unhappy? So are they just supposed to leave their institution because of racist actions? We put the burden on the oppressed too many times in America. We don’t seek to challenge the oppressor, but we seek to discredit the oppressed. To the students of Missouri, I stand by you. I support you. And I thank you for not letting race sit on the back burner again. This conversation is way overdue and it’s time for it to start. Your fight will be the spark that lights this flame. A fellow African American student who loves his PWI too.